This is a deck created by Team Juggernauts and TJ SamuelJ was so kind to lend to me to play so I could get some experience with Ter Adun. It is a very interesting approach that I had never considered which helped to broad my views of how the tribe can be played. My initial thoughts on the deck was to play it as control and constantly keep the board clear using stall tactics to assist with the survival of your allies. In the end I decided the deck was really based on an OTK (one turn kill) combo using Cleric of the Asyn and Clerics Mantle combo and chaining mass destruction to deal massive amounts of damage to the hero in one turn. OTK has become more of a possibility in Shadow Era with the Shattered Fates expansion. For the OTK combo you will be using Cleric’s Mantle to target Cleric of the Asyn, this will allow the decks synergies to begin. When an item/ability is destroyed this turn, Cleric of the Asyn will gain +2 attack and because of Cleric’s Mantle he will also attack the hero. We are hoping to chain this 2-3 times in a particular turn, this is all in addition to his normal attack which he can still perform. Everything else in the deck should be geared towards enhancing this particular combo, which is also why Ter Adun is a good hero to use for this build as his ability is a +1 item destruction which can target and trigger Cleric’s Mantle. 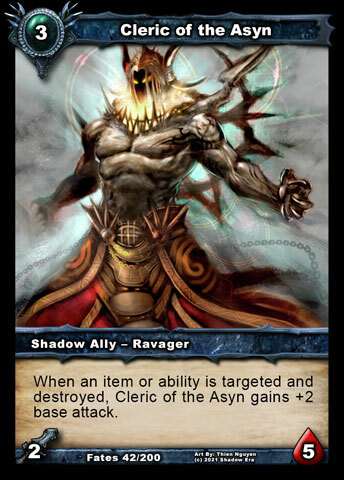 This is the first Ravager deck that I have used without Thriss Almanac. It was very weird for me probably because the other classes do not have an alternative tribe item. Crown of Ages actually replaces Thriss Almanac in this build for several reasons: cheaper cost, not having Sustain 1, and Yari Bladedancer. The low costs/maintenance is very important to the deck because of all the setup for combos and leaving windows for playing Bad Santa. 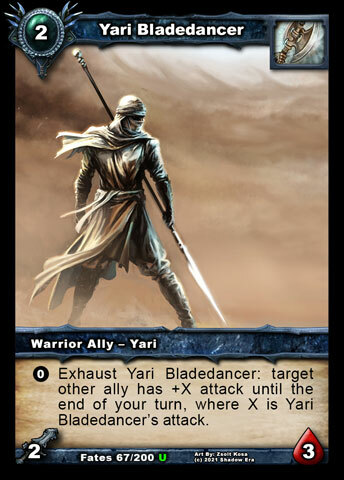 Yari Bladedancer is the other reason we are using Crown of Ages which benefits both Ravager and Yari Tribe allies. Yari Bladedancer has two great utilities to this deck. He provides an excellent early game option for controlling the board. 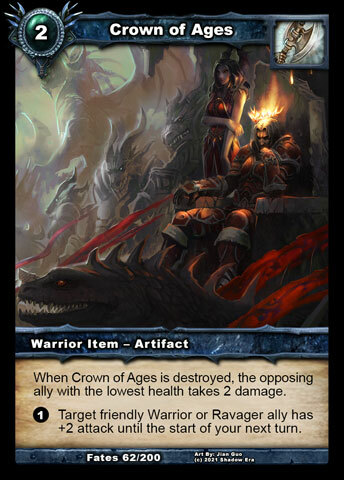 His ability is a nice buff feature he grants to one of his fellow allies which emulates the effects of Crown of Ages, but can also be combined with Crown for taking down high health allies if necessary. This transfer of attack also combos very effectively with our game ending OTK combo of Clerics Mantle, Cleric of the Asyn and mass destruction. Bladedancer can transfer his attack to Cleric of the Asyn to increase the potential damage reducing the number of abilities/items needing to be destroyed to take out opponents hero. So you can see that the combo is very powerful but very combo oriented as well. This lead us to the other cards in the deck. The deck relies on some cheap stall tactics to allow you to transition while you are setting up your combos. Both Crippling Blow and Rain Delay are some of the best affordable options. Crippling Blow is just great for shutting down opponents allies, used early for stall then later in game as platform to combo your OTK. Rain Delay is great for mass stall. Typically you are not going to want to play this until you have a release point, something to destroy it on your following turn. This is where Ter Adun’s ability comes in handy, however Ravager Zealot can perform this task as well. NOTE: Cleric’s Mantle does not remove the negative effects of Rain Delay (can’t attack) while Rain Delay is still in play as the effects are constantly being applied. I briefly tried Lythian Shackles, which I though would be amazing, but found that like Rain Delay you had to play it when you could time its destruction. Also the exhausting Hero cost was a pain to deal with at times. Ravager Zealot has some flexible utility in this build. He can be used as a destruction catalyst or as a finisher. 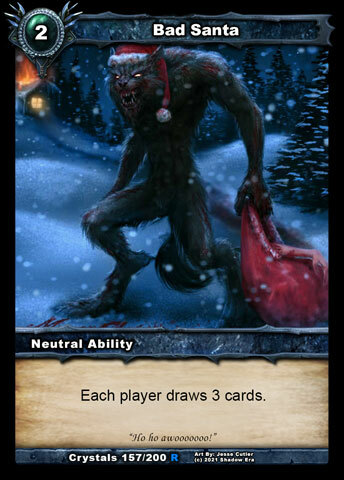 The drawing of this deck comes from Blood Frenzy and Bad Santa. Both of these option are very solid choices as they both help provide massive draw to help dig for your cheap stall tools. Bad Santa actually works in this build since you are not caring too much about giving opponent cards, its more about getting your combo cards so you can execute the one turn kill. I would not hate on anyone maxing Bad Santa. I did briefly try Crystal Shards for a while but felt the draw was slow for digging and discard often got rid of the cards I was digging for. Initially I found Murderous Hulk to be an odd choice for inclusion in the deck, so I played some games with Spitfire Hound as alternative too. In the end both had similar results just different execution. Murderous Hulk is probably the better choice over all since his high health gives a chance for better survivability. 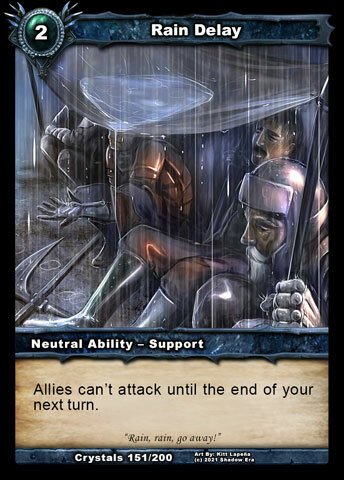 He becomes a great ally to have on the board when Rain Delay comes out being able to potentially kill an ally and combo Obelisk of Echoes to destroy Rain Delay so you can begin attacking again. Spitfire Hound was a more direct affordable destruction option with a bit of control. The deck is an all or nothing approach so you will have some amazing wins, some close loses or just complete blow outs. All in all I really enjoyed playing the deck. 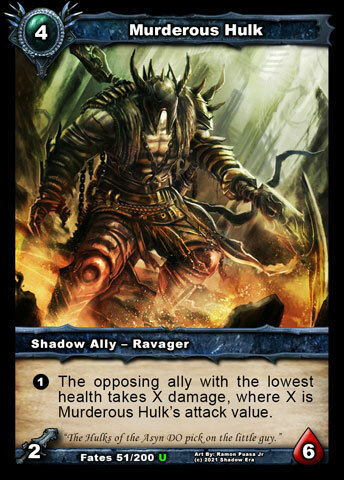 I learned more about how to play a one turn kill deck and a new way to play the Ravager Tribe. Tagged destruction, Ravager, shattered fates, stall, ter adun, tribe. « Path to Immortality: An A1 Alliance Tournament!